For anyone shipping cargo to the UAE from the USA, whether it’s for a move, business or overseas purchase, dealing with the paperwork, customs and processes can be frustrating without the help of an experienced international freight forwarder. The United Arab Emirates, like Saudi Arabia, Kuwait, and the other countries in the middle east, has its own requirements that goods must meet in order for them to be eligible for entrance, which is something our shipping company has over 37 experience doing. The majority of consignments and freight we ship to the United Arab Emirates are bound for two locations: Dubai and Abu Dhabi. These cities also happen to be home to the two largest ports for containerized cargo. It’s important to note that when shipping ocean freight to the UAE from the USA, most steam lines use Dubai as the port of entry but this can vary depending on the type of service. This is where your shipment will enter and clear customs when using our container shipping service. The partner agents in Dubai can arrange for further transportation of your goods if needed, or clients can pick the cargo up themselves at the loading facility. Our shipping locations in the US include Los Angeles, New York, Houston, Miami and Savannah. In addition to our ocean container services, we also offer alternatives depending on the cargo in question. For larger items like boats and heavy equipment, we also offer a Ro-Ro service. This service is ideal for any freight that won’t fit inside the standard 40ft container. For those that need an item shipped in a relatively short period of time, we offer an air freight service and have our own department specialists. *Most of the information below applies to those completing the import process themselves, however, it’s usually completed by our receiving agents in Dubai. Any goods being imported into the United Arab Emirates, regardless of whether it’s via ocean freight or air freight, will be subject to the following customs procedures. First, individuals need to submit a detailed customs declaration including any additional documentation that may be needed. ie. bill of lading/bill of sale if you want to ship a vehicle. Register customs declaration with the competent customs officer. Transfer goods to examination, checking and inspection. Evaluate goods for the purposes of payment of customs duties. What to Know Before Shipping to the United Arab Emirates. 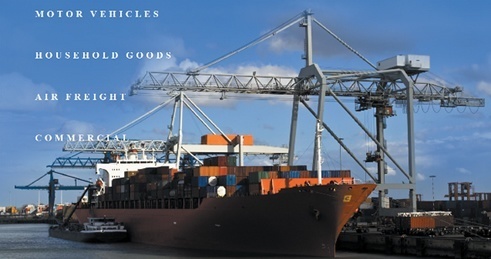 Different costs are associated with shipping to the UAE depending on the commodities. For those bringing a motor vehicle, certain restrictions apply to the vehicle’s history as well as driving specifications. If the car meets the import requirements, then to clear customs in Dubai expect to pay 5% tax on the total value of the vehicle. For other items, as long as they are in an amount acceptable for personal use then there is no customs tax; just an inspection fee. You may also have to present a permit or an import license for certain items. Whenever you are shipping internationally, there many steps, and the UAE is no exception. Depending on which US departure port your belongings are shipping out of and the type of cargo, transit times and costs will vary. Those moving goods from the west coast, such as our warehouse in Los Angeles, can expect the container to be on the water for 5-7 weeks usually, as it will be transshipped. Shipping from the east coast of the United States to either Dubai or Abu Dhabi generally takes between 3-5 weeks on the water depending on the service used. It will also be transshipped. This means it will be transferred from one vessel to another. The feeder vessel usually picks up within one week and then moves containers and other cargo to the final destination. Need additional information for shipping your cargo to the UAE? Call us today to speak with an expert at (562) 408-6677 or get a free online quote. Get a FREE Shipping Rate Today.